I haven’t written as much about Baxter on this blog since I started writing for ThatMutt.com. But Mr. B is still our favourite dude and a huge part of life at the farm. I love that he’s by my side as I work on projects or walk over the property. And I love that he’s opened up other opportunities for me, like writing for ThatMutt.com, or connecting with our off leash hiking group. Baxter came to live with us July 7, 2013, so last week was his fourth gotcha anniversary. I’m keeping up my annual tradition of writing a letter to Baxter (inspired by Tracey at love lives on). It’s posted at ThatMutt.com. Here are my letters from year 1, year 2 , year 3 and Baxter’s adoption story. That’s a lovely letter. How old is Bax now? We get the same question about Bear. 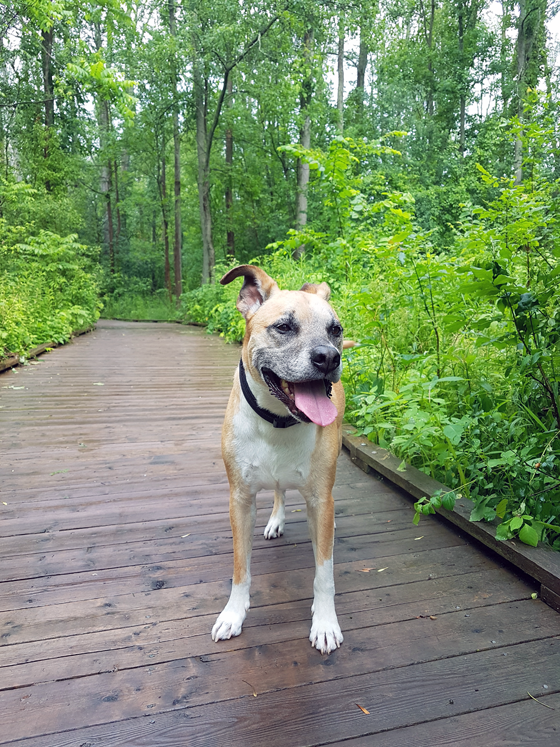 He’s 10, which is old for such a huge dog, but since he started on his thyroid pills he’s like a puppy again on our walks! That’s so great to hear that Bear’s energy is up. That must be very rewarding to see. Bax is going on 7 this fall. He seems like such an old man already though. When he makes it to 10, he’ll likely appear ancient! Such a lucky boy, that Baxter! We all got lucky four years ago. I feel there is nothing like the love for and love from a dog!